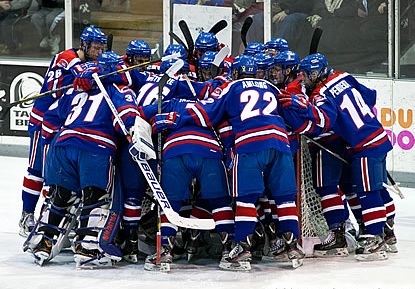 The University of Massachusetts Lowell (UMass-Lowell, UML) River Hawks came into the 2012-13 college hockey season with very high expectations. The River Hawks amassed an impressive 24-13-1 record (17-9-1 in Hockey East) last season and finished tied for second in Hockey East. The bar was set for the team to have to put in a similar, if not better, performance this year. Unfortunately the River Hawks last season lost out to the Providence Friars in a best-of-three series that went down to the wire during the first round of the Hockey East Playoffs (HE). It was the first time a 7th seed knocked off a 2nd seed in Hockey East Playoff history. After regrouping from the disappointing early exit in the HE Playoffs, the River Hawks focused on making a run in the NCAA tournament, making an appearance for their first time in 16 years. UML was able to knock off Miami-Ohio 4-3 in OT after blowing a 3-0 lead midway through the third period. However, Union College put an end to the River Hawks’ season with a 4-2 victory the following day. The team had come a long way with an overall 25-win season after just winning five total games the previous year. The tale of this season as the River Hawks started off nationally ranked seventh was very simple: make it back to the NCAA tournament and go even further! The team did lose a couple great players such as David Vallorani and Matt Ferreira who helped contribute to the River Hawks’ spectacular season last year. The core of the team would still remain intact despite losing a few senior players at the end. The River Hawks started off their season with a disappointing 2-6-1 record. Quickly they found themselves drop from being ranked nationally to not even being in the talks for the national poll. The team struggled to produce goals and the defense was constantly outplayed. Then perhaps a true new era began for the River Hawks, who were going into the winter break looking for some consistency of play and answers on how to turn their season around. Junior goalie, Doug Carr, was having a down year after posting a 22-10-1 record (2.13 GAA, .928%) the previous year. That was when freshman goalie Connor Hellebuyck, who was drafted in the fifth round (130th overall) of the 2012 NHL Entry Draft by the Winnipeg Jets, stepped in and started to lead the way. Hellebuyck went on a stretch where he would win 13 consecutive games for the River Hawks, amassing a 14-2-0 record (1.49 GAA, .945% ) with four shutouts. He was truly a force not to be reckoned with and kept UML in every single game. Carr, however, went from star goalie the previous season to backup duties due to just how well Hellebuyck was playing down the stretch. With Hellebuyck between the pipes for the majority of the second half, UML turned their season around going 20-4-1 (including an undefeated stretch of 10-0-1) in their final 25 games of the season. 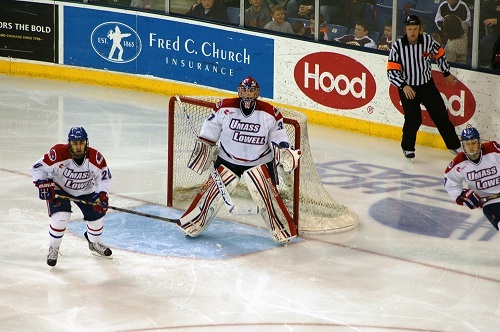 Connor Hellebuyck and the River Hawks in action. In the end, the River Hawks turned their season around from a record of 2-6-1 to a very respectable 22-10-2 and went on to be the regular season champs in Hockey East. This was the first time in school history that UML finished first in HE, becoming only the fifth different team in HE to ever claim the title aside from the big 4: Boston College, Boston University, University of New Hampshire, and University of Maine. The Riverhawks have had a great turnaround and there’s no question about it. Junior forward, Joseph Pendenza (12-22-34), finished the regular season by leading the team in points followed by sophomore forward Scott Wilson (12-17-29), junior forward Derek Arnold (10-15-25) and junior forward and captain Riley Wetmore (15-9-24). Not to mention that even freshman forwards such as Adam Chapie (4-0-4) and Michael Colantone (5-2-7) had important game winning goals, five between the two to be exact, through the season. Junior defenseman Chad Ruhwedel (7-11-18) lead the team with a +14 rating and was the heart and soul in anchoring both the power plays and penalty kill units. The season, though, is not over, and playoffs are now upon us. For the second straight year, UML will have home ice in the first round of the playoffs and will host the University of Maine Black Bears tonight. Maine won two of three against the River Hawks in the regular season series and will not be an easy 8th seed matchup. Maine also owns a 14-1 all-time record vs. the River Hawks in the Hockey East playoffs, which includes a 9-1 record in the quarterfinal round. UML fans should expect a hard fought series to go the full distance of three games into this Sunday, with the River Hawks advancing to the semifinals round to be played at the TD Garden on March 22nd. UMass Lowell will be the top seed in the 2013 Hockey East Tournament. What other expectations do the River Hawks have other than going for their first ever Hockey East Title? The answer is once again simple: go all the way. This team finished ranked 6th nationally and at the current moment holds the 4th overall seed in the NCAA tournament. If UML holds onto the same positioning going forward, it will be more than favorable for them to win-out their regional in Manchester and make their first ever school appearance in a Frozen Final Four! That is the goal this year and anything short would be rather disappointing after last year’s performance. Of course take into consideration that winning a Hockey East Title and not making it to a Final Four appearance wouldn’t be the end of the world either. At the least it would be truly making history once more; something this team has gotten accustom to doing over the last couple of seasons.